Hurricane Emilia strengthens rapidly to category two status. At 800 am PDT the center of Hurricane Emilia was located near latitude 12.6 north / longitude 109.9 west about 710 mi / 1145 km south of the southern tip of Baja California. Emilia is moving toward the west-northwest near 19 km/h and this general motion is expected to continue for the next couple of days. Satellite images indicate that the maximum sustained winds have increased to near 160 km/h with higher gusts. Emilia is a category two hurricane on the Saffir-Simpson scale. Additional strengthening is forecast during the next day or so and Emilia could become a major hurricane later today. Daniel s maintaining hurricane status while moving westward. 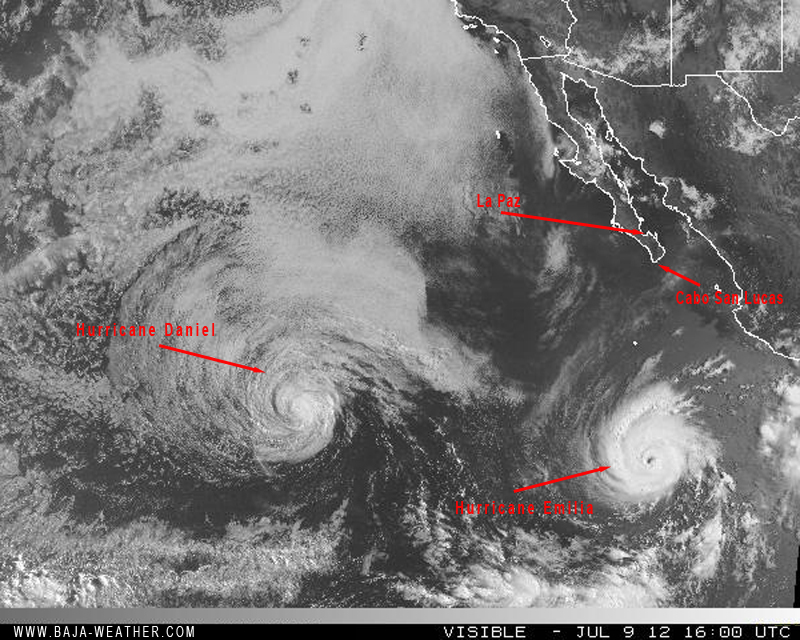 At 800 am PDT the center of Hurricane Daniel was located near latitude 15.3 north / longitude 129.1 west. Daniel is moving toward the west near 24 km/h and this general motion with a slight increase in forward speed is expected during the next couple of days.